This study investigates the effects of intellectual property rights (IPR) protection on economies by proposing a three-pole global economy model. The main proposition of the study is that the classical two-pole approach (north–south) does not reflect the technological heterogeneity and conflicts within the developing world. Therefore, a three-pole world economy model which consists of the following regions has been designed; the north which innovates the northern products, the east which innovates the eastern products and also tries to imitate the northern products, and lastly, the south which tries to imitate both the eastern products and the northern products that have been already imitated by the east. Thus, the model suggests a world system depending on global imitation chains. 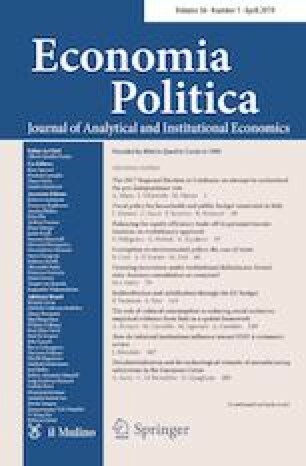 The numeric simulation results reveal firstly, the northern region benefits from tighter IPR policies in any case; secondly, stronger protection of IPR certainly exerts negative effects in the south while it brings benefits the eastern region in a way that highlights the main contribution of the paper. The authors are grateful to two anonymous reviewers for their invaluable comments and critiques which have greatly contributed to the improvement of the earlier version of this paper. World Development Indicators. (2019). Washington, DC: The World Bank. https://databank.worldbank.org/data/source/world-development-indicators. Accessed 11 Jan 2019.